Enjoy your stay in Slovakia for 14 days, 4 weeks or even 6 months without having to worry about living in overpriced hotels or dormitories with no privacy. 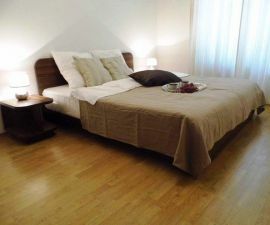 You can rent a fully furnished apartment in Slovakia on Flatio easily, in a few minutes, and according to your needs. 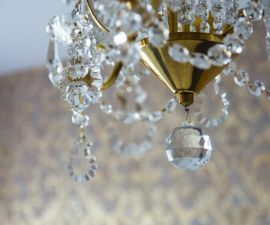 All it takes is to look through photos and virtual tours of offers online, request reservation of a rental and wait max. 24 hours for confirmation. Then you just agree on documentation, you get keys, and your stay begins. No unnecessary delays, real estate fees or buying of appliances. Are you going for a business trip, a study visit or a trip to Slovakia where you want to stay for 14 days or even 6 months? Pick from mid-term rentals of assorted dispositions on Flatio. You’ll avoid overpriced hotels and won’t have to worry about whether you’ll have a good roommate in the dorms. 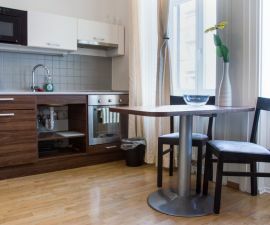 Renting an apartment in Slovakia is fast and easy. You just need to take a look at newest offers on Flatio every day and explore them via photos and virtual tours. After, you’ll make a reservation and wait max. 24 hours for confirmation. You’ll agree on the handing over of keys and you can move in. 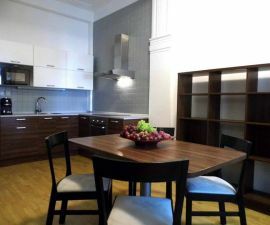 How to rent an apartment in Slovakia? Are you planning to live in Slovakia for a month or maybe half a year? 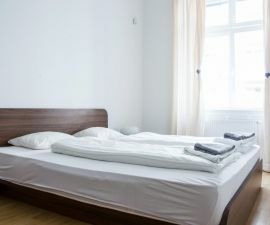 If you don’t want to pay for overpriced hotels or boarding houses and you’re not a fan of dormitories check out mid-term rentals selection on Flatio. As a foreigner, you have the same options as Slovaks, you just need valid personal documents and necessary contractual documentation. I want to rent an apartment on Flatio. How? You pick from a wide selection of rentals of various dispositions. Look at virtual tours and photos. Choose the ideal place according to your needs. 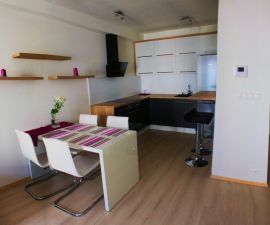 Request reservation of the desired apartment and pay a fee of 19€. Wait a maximum of 24 hours for the landlord to confirm. After, you’ll need to sort out the documentation and agree on the handover of keys. Thanks to Flatio you will know within a day where you’ll be staying for 14 days, a month or half a year. 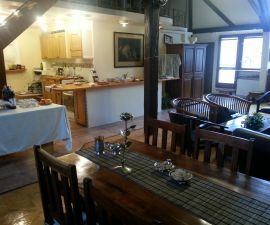 Do you need to find accommodation for a few months in Slovakia? Slovakia is a picturesque country located in central Europe. Are you planning to go there in the next month and want to stay for 14 days, 4 weeks or half a year? Whether you go to Slovakia on a business trip, study visit or it’s one of the many stops on your nomad journey through the world, there’s something for everyone. In Bratislava, as well as other larger cities in Slovakia, you’ll find many coworking centres, where you can be networking from dusk till dawn. 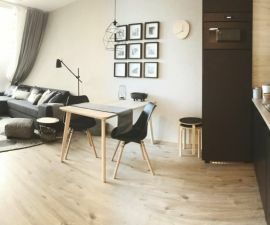 And don’t despair, you don’t have to live in overpriced hotels, you just need to check out Flatio and pick a suitable mid-term or short-term rental of various dispositions. 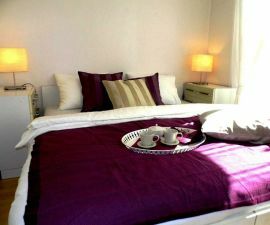 The offer has studio flats, small two-room apartments, bigger five-room apartments or even luxury accommodation. No later than 24 hours after your online reservation you’ll know if the chosen rental is yours. 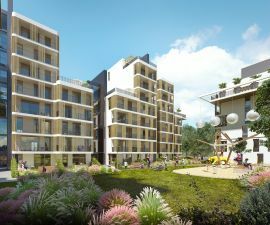 What are the advantages of renting a flat on Flatio? Businesses can pay via invoice within 60 days. Experience Slovakia first-hand. Go to this central European land for an internship, to study, to work or to gather inspiration as a digital nomad. Thanks to the Flatio team, renting an apartment in a location that interests you is fast, easy, and cost effective. 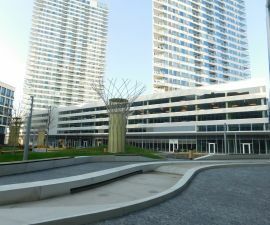 No commission nor steep real estate fees will bother you with us – you’ll only pay 19€ reservation fee and a service fee calculated based on the duration of your stay. If your business trip, study visit or a trip to meet friends leads you to Slovakia for 14 days, 4 weeks or even a few months, inform yourself about the local cost of living. It differs not only based on the country but based on the desired city and location you want to stay in. The average living expenses in Slovakia are comparable to those in Czech Republic. Like in other countries of Europe, living in the capital is more expensive. A cheaper alternative can be found for example in Nitra or Žilina. The biggest dent in your monthly expenses will be both the rent and food. The cost of living in Slovakia, compared to other European countries, is cheaper. 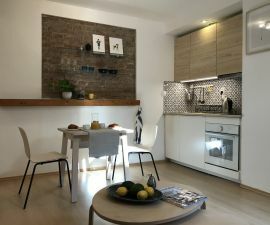 The average price of a rent in Slovakia for a four-room apartment in the capital is 941€ which is much less expensive than in Germany or Austria. 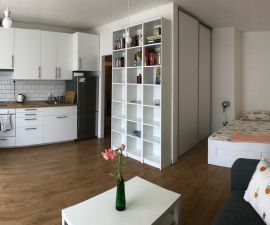 Living expenses in Bratislava are, of course, different, depending on the location – they are higher in the centre whereas the periphery will cost you less. It’s up to you, which city district will you choose in the end. Is a half a year-long study visit in Slovakia ahead of you and you don’t want to live in the dorms because of the noise? Or is your company moving employees to Slovakia for a few months and hotels are needlessly expensive? 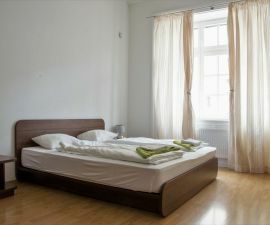 Both examples have a simple solution for finding accommodation. 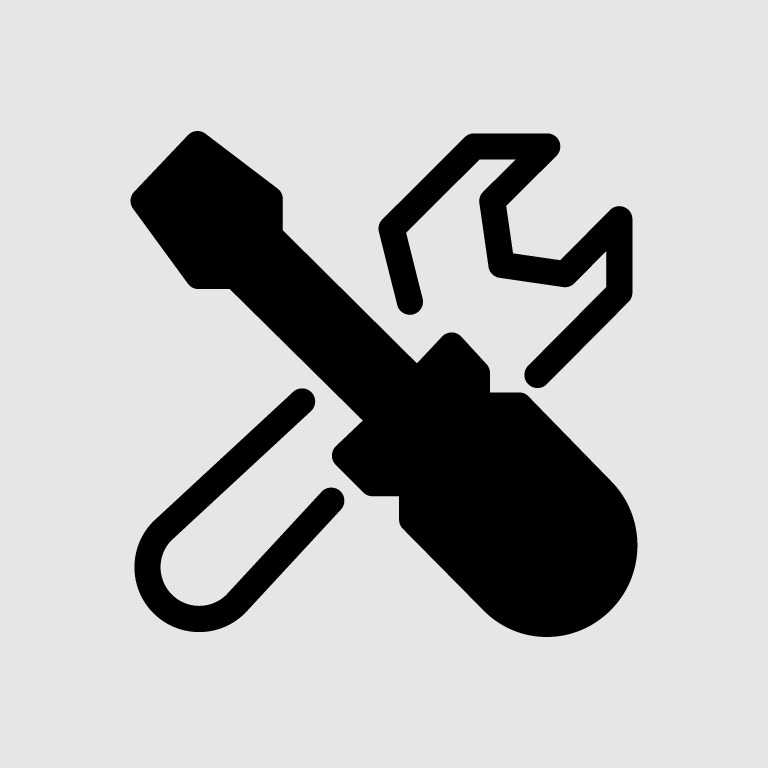 Use the wide selection of rentals on Flatio of various dispositions that you can get for 14 days and up to 6 months. What are the 3 advantages of rentals on Flatio? Speed – in 24 hours you’ll have a confirmation that an apartment is yours. No fees to real estate agencies. The offer contains only fully furnished flats. Both working and studying in Slovakia is, thanks to Flatio, comfortable. 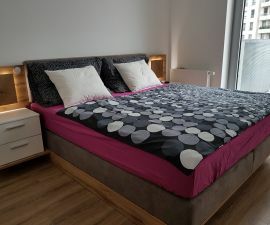 As a business owner, you’ll find rentals for employees in Slovakia fast and easy; as a student, you can find a home with more than enough privacy. Travel to Slovakia in pursuit of higher education in local schools and experience a few months of learning about the culture and meeting new friends. There are many universities in Slovakia and most of them provide studies for foreigners. Are you intrigued by the Comenius University in Bratislava or do you favour Technical University of Košice more? 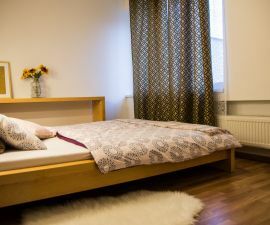 Find a place to stay ahead of time in a chosen city so that you don’t have to deal with a lack of privacy in the dorms which tend to be noisy. On Flatio you can choose from apartments of assorted dispositions that suit your needs. After, you only request reservation online and in max. 24 hours you'll know if it’s yours. Are you planning a study visit to Slovakia? Experience Erasmus in Bratislava, Trnava or maybe Banská Bystrica. Local universities are ready for students from all over the world and will give you memories that you’ll be carrying with you for a long time. 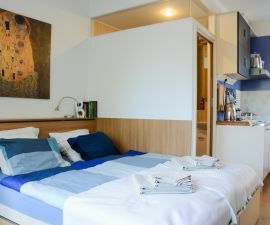 If you don’t like staying in noisy university dormitories check out the selection of rentals for 14 days, a month or maybe even half a year. You can get a room, a studio flat or a four-room apartment with a few friends. 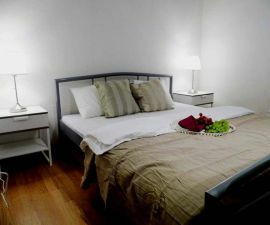 All according to your needs and fully furnished, with appliances. You can reserve a rental from anywhere in the world where there’s an internet connection. Looking for a language school that will teach you Slovak? If you’re planning to travel to Slovakia for a few months, get Slovak language courses for foreigners in Bratislava, Trnava, or even Košice. Local language schools provide individual courses, group classes or even online courses – all according to client’s needs. You can turn to Inštitút jazykov a vzdelávania, Súkromná jazyková škola SOPHIA or Centre of Language and Academic Preparation. You don’t want higher expenses, but you’d like to learn at least the basics of a language during your stay? Free Slovak courses for foreigners can be found online or as part of your Erasmus stay, usually provided by the Universities.